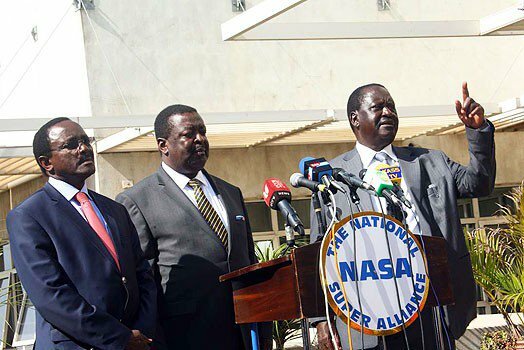 The simmering row between Raila Odinga led Orange Democratic Movement (ODM) party and Musalia Mudavadi Amani National Congress (ANC) has finally boiled in what might signal the death of the National Super Alliance (NASA). NASA is constituted by Orange Democratic Movement (ODM), Amani National Congress (ANC), Wiper and FORD Kenya. In the latest changes, MPs perceived to be rebels to Nasa Leader Raila Odinga have been moved from several committees and in their places taken by perceived Odinga’s loyalists. This as ANC protested the replacement of their members in various House committees citing breach of the coalition agreement. Butere MP Tindi Mwale, who doubles up as ANC Chief Whip told Kisasa news that the Orange party is insincere as positions are shared equally among coalition partners. 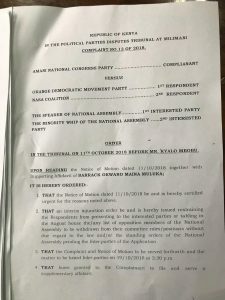 “Our friends in ODM are dishonest in substituting and alienating our members, we won’t allow them to bring their dictatorial tendencies to Parliament,” Mr Mwale told journalists at parliament buildings, as he presented a copy of a court order that purportedly restrained the minority Whip Junet Mohammed from swapping them. Butere MP Tindi Mwale of ANC and his Mwingi Central Gideon Mulyungi (Wiper) have been de-whipped from Public Investment Committee and their places taken by Homabay Women representative Gladys Wanga (ODM) and Shinyalu MP Justus Kizito Mugali (ODM). Luanda MP Christopher Omulele and Kitui West Edith Nyenze has been nominated to the departmental on Finance and National Planning to replace Webuye West MP (ANC) Alfred Sambu and Kitui Rural MP (WIPER) David Mwalika respectively. Mr Sambu, a former Kenya Football Federation Chairman , nominated to the select Constitutional Implementation and Oversight to replace Ruaraka MP (ODM) Tom Kajwang’ to the power watchdog committee of Public Accounts Committee (PAC). Kajwang replaces Nambale MP John Bunyasi (ANC) who has been moved to Budget and appropriation committee. Bunyasi replaces Khiswero MP (ANC) Christopher Aseka at Budget and appropriation committee. Homabay MP Peter Kaluma (ODM) replaces Shinyalu MP Justus Kizito at the departmental Committee on Administration and National Security. Tindi and Mulyungi has been transferred to committee on Delegated legislation to replace Hamisi MP Charles Gimose (Ford Kenya) and Mvita MP Abdulswamad Sharrif Nassir (ODM). Mr Nassir is the Chairman of Public Investment Committee. The youthful South Mugirango MP Silvanus Osoro elected on Kenya National Congress (KNC) allied to NASA and who has declared Deputy President William Ruto 2022 presidential bid, has been moved from the Departmental on Defence and Foreign Relations to the Committee on Agriculture and Livestock. Mombasa Women Representative Asha Mohammed Hussein takes up Osoro’s slot at Defence and Foreign Relations committee. “South Mugirango MP Silvanus Osoro be appointed to the Departmental Committee on Agriculture and Livestock to take up the remaining slot for the minority,” read part of the motion. Mr Lokiru (ODM) has been moved to the departmental committee on Trade, Industry and cooperatives to replace Kwanza MP Ferdinard Wanyonyi. Mr Wanyonyi moves to the select committee on National Government Constituencies Development Fund to replace James Lusweti. Majority leader Aden Duale and his Minority John Mbadi dismissed any political undertones in the recent changes saying it was prerogative of the whips to move members in various committees taking into consideration their competencies and contribution. ← Breaking News: Ochillo Ayako Wins Migori Senate By-Election!